I stopped in to see the Albert Barnes exhibit while on a trip to Philadelphia a few weeks ago. Here is a little background for those unfamiliar with Dr. Barnes and his collection. 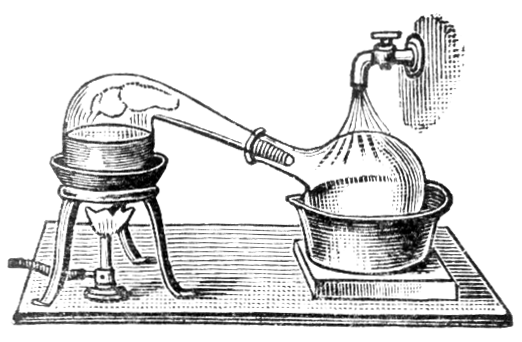 The man made a fortune with the invention of a remarkable colloidal silver compound called Argyrol that was used to treat infant blindness and gonorrhea infection in war veterans. (It was all the more remarkable since I had no idea those two things were even remotely related.) With the money he made from Argyrol, Dr. Barnes traveled to Europe at the turn of the twentieth century, bought a slew of paintings by a few maverick artists all but unknown in America at the time and put them on display in a mansion in Merion, Pennsylvania. These unknowns turned out to be some of the greatest artists the world has ever seen. Van Gogh, Monet, Cezanne, Matisse, Seurat, Modigliani, Renoir, Picasso, Soutine and a bunch of other impressionists, modernists and absinthe drinkers. Today the whole collection is worth something like twenty-five billion dollars. Good eye, Dr. Barnes, wherever you are, good eye. He even had Matisse come over from France and paint an installation on a wall in his mansion just to get really wild. These days that would be like inviting Martin Scorsese over to make a film that ran round-the-clock in one room of the house. “The Wolf of Living Room Wall Street,” perhaps. In preparation for my trip to the Dr. Albert Barnes collection I did what any normal person would do. I drank as much Argyrol as I could get my hands on, figuring that Dr. Barnes must’ve consumed some of his own invention and this may have been what enabled his extraordinary eye for fine art. Too bad I got a mild case of metallic poisoning, and had to put off my visit for a few days while the doctors wondered whether I’d survive. Eventually I got there. I will admit that I am no art connoisseur. I go with my gut instead of my head. I like to feel the reflexive sensation of awe and the inexplicable electricity of the whole piece instead of scrutinizing color usage, brush stroke, shade and shadow, image and perspective. I avoid the kind of tedious assessments that trick the amateur art critic into thinking that he or she had something instrumental to do with the creation of the piece in the first place. The type that, with a bland appraisal of a landscape, believe they can backdate their own contribution to the artist’s achievement. The halls were teeming with roving mobs of eager art enthusiasts attached to their instructors, growling and snarling like wild dogs trained on their alpha leader. I stayed out of their way for my own safety. Even so, one tried to bite my arm when I stepped in front of a still life. Another pulled a knife on me when I scoffed at the suggestion that the grotesque representation of hands in the portraits by Soutine was the truest example of despair. A patron of the arts urinated on me then tried to cover me in dirt and leaves. We were all in secret competition to be the best spectators. I stroked the small patch of hair on my chin thoughtfully. Others rested the jaw in the palm of the hand. Many heads were cocked to one side. One woman nibbled on the back piece of her eyeglass frame, the part that hooks the ear. The winner of this little game was a thin fellow in one of the rooms with his shoes off, sitting in the lotus position on a bench while he maniacally stared at one of the pictures, right before, I suppose, he went off to riddle his workplace with bullets. As I passed through room after room I decided something was nagging me–source inexplicable. I was suffering some kind of brain fade. I felt self-conscious, a natural forgery in my own skin, worthless, stultified. I was not part of the creative act. I could offer nothing. I was a shuffling spectator. I needed some reinforcement, or an assurance that some part of the divine spark was within me. Luckily Joseph Roulin came to my rescue. 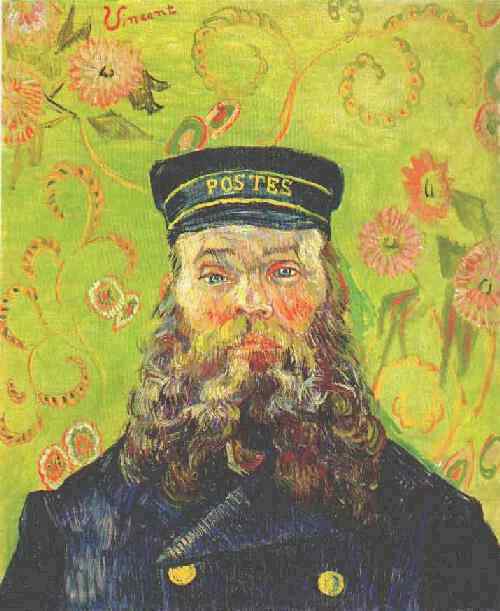 This is Joseph Roulin, Van Gogh’s postal worker, friend, caretaker. The guy who delivers my mail does not look like this, much to my disappointment. I like to think that the backdrop to this picture wasn’t an artistic decision by Van Gogh. I like to think that when Joe Roulin arrived, wherever, that was just what people saw behind him. Here comes Joe Roulin, here comes my mail packages, and here comes a kaleidoscope of whirly visuals. Van Gogh got him, right on. There is Joe Roulin. He is dignified. Perfectly genuine. He is fallible. He is the divine spark tempered by the infirmity of nature, to quote St. Augustine. I picture him, Joe Roulin, delivering wax-sealed parchments with florid messages printed on them. “Bonjour,” he would grunt, with a tip of his hat. I picture him sitting down in a cafe after he is done with his deliveries, putting his hat on the chair next to him, ordering an absinthe, drinking it thoughtfully, preferring to be alone. I picture him kneeling at a cathedral. I picture him shuffling into a brothel. I picture him sitting on a bench, watching the pedestrians, with a pipe tucked into that river of a beard. Thank you, Joseph Roulin. Somewhat revitalized, I continued to wend my way through the rooms, taking Joe Roulin with me, knowing that nobody would mess with me now. 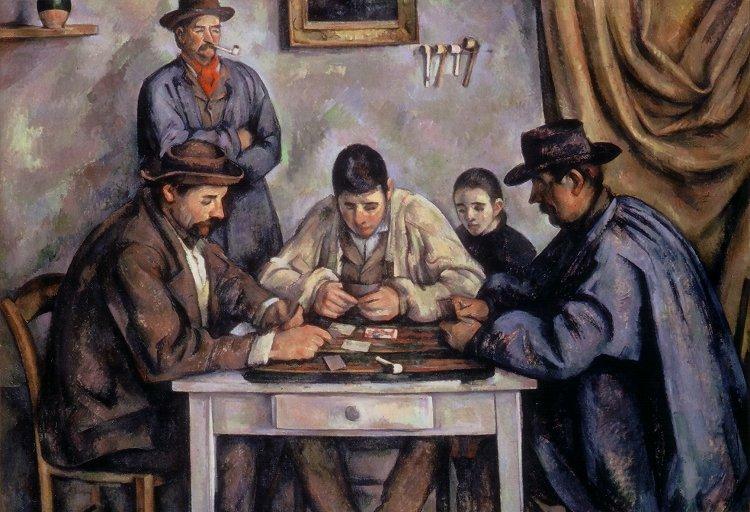 Then I happened upon The Card Players, by Cezanne. This was the second big lottery strike for me. I had one of those existential drops in temperature upon seeing it, like when swimming in a lake and finding, for a few seconds, that a passing bulk of immediate water is somehow a good ten degrees cooler, before everything returns to normal. The card player on the left had such a soft look of grim inevitability that he seemed to hold the specter of big daddy death in the cards spread across his hands. All of them had the look. There were no winners, yet they kept playing. They could not do otherwise. I surmised the man with the pipe standing in the back was the owner of the establishment, and although he never smiled, he always won. The young ghost hovering seemed to suggest that the money gambled could be put to something useful, and it never would. It was such an awesome fatalism that I felt the entire human struggle collapse into that square portrait and then kick back out in some huge bang. I hurried outside to get some fresh air. I had accomplished what I had come to do, that is, to forget myself, to forget the kind of time that impels scheduled arrivals and departures, and instead to linger in the natural infinity, like shaking the numbers off a clock, spinning it wildly, and letting it stop to wherever the hands end up pointing. The air felt good. It smelled of imminent rain. I sat down next to a pool of flat rocks and let my fingers walk through the water.